Remote Control Fishing Boat-Big Fish Most Fish Video Reward Challange! By now there’s thousands of fishermen out there catching fish with The RC Fishing Pole and we want to see your biggest fish caught with a Fish Fun Co. Product. We’ve heard stories of massive Muskies, Stripers, Bass caught, here’s a chance to post that big fish video and qualify for a $100 dollar prize! Use The RC Fishing Pole an any Rc Boat or use your Radio Ranger, Bass Pro or LuckyStrike! The rules are simple, Big Fish using the Line Release, or Most Fish Pulling in With The Boat, (any size fish). $100 for each winning video posted. Fish Fun Co. is going to run this promotion for 90 days, so get your video in by the end of November! Upload it to Youtube, or email or send it to Fish Fun Co.
Additional Item-Please make the video interesting as possible! Http://RcFishingWorld.com Big Remote Control Fishing Contest! Five Pound Catfish Fights with Remote Control Fishing Boat! What do you get when you mix fishing and remote control boats? 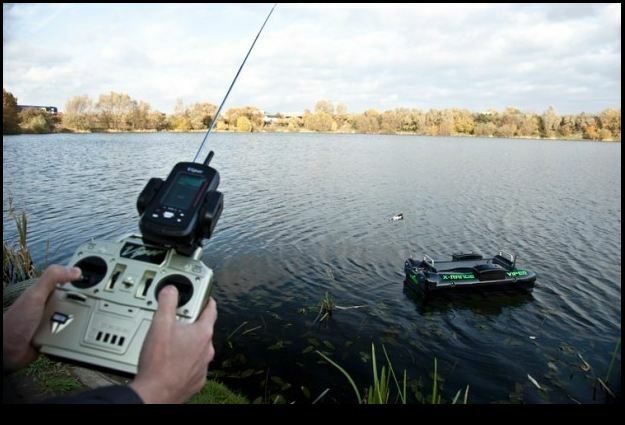 Rc Fishing,…….or remote control fishing. Watch as these guys deploy their rc fishing boat called The Radio Ranger, fishing line hook, and bait. How do they attach their fishing line to the rc boat, with The RC Fishing Pole. Made by Fish Fun Co., The RC Fishing Pole attachs to any remote control boat and turns it into a remote control fishing boat. The Rc Fishing Pole allows you to extend your line far from the back of the rc boat, and has two features. One, you can tie a piece of line on the end and troll with a small hook, when you get a bite you drive the fish in tow to the shore. You can also use the line release, so instead of casting with your fishing pole, your line goes on the end of the Rc Pole, let the boat drive your line out, then release it where you want. We,ve seen alott of great rc fishing videos this summer, but this one is a first, the fish is very big. Almost too big for the boat to pull in and gives the boat quite a challenge. You’re really not supposed to go after the big fish if you plan on pulling it in with the rc boat. You’re supposed to use the line release, then you can catch the big ones. I’d imagine it is pretty tempting to put a big hook on the line and see what bites, but as you can see in the video had the catfish been much bigger you’d have seen the boat disappear under the water. My suggestion is that if you’re going to try that, then seal the hatch with “Hatch Tape”, available at any hobby shop. And maybe add a balloon to the end of the rc fishing pole, or use a balloon as a bobber, like the big buoys they use for shark fishing. Back to the video, hats off to these guys for taking a big risk and seeing the reward of a five-pound catfish caught with their Radio Ranger Rc Fishing Boat! If you happen to have a Fish Fun Co. Product and make a video of your fishing adventure, you get a new Rc Fishing Boat free from Http://www.RcFishingWorld.com, check them out! children who otherwise don’t receive enough recognition for their generous sacrifices. Since 2009 Fish Fun Co has risen to support our troops, here and abroad. After hearing about the “Take a Vet Fishing Day Tournament” we had the satisfaction of a few smiles on the faces of our troops and their children who otherwise don’t receive enough recognition for their generous sacrifices. 2011 is no different! At the May 2009 ‘Take A Vet Fishing” tournament we met an amazing young soldier named Jason Lettermen. He was a couple months away from retirement when he lost both legs while serving in the Middle East. When Jason arrived at the tournament he was in a wheelchair and was extremely excitied about participating in the event. We were fortunate to have the opportunity to spend a lot of time with this amazing young man. He wanted to know everything we could tell him about fishing and we provided him with details on how to use all of the baits that we gave him. Unfortunately it rained hard the night before the tournament and the ground was muddy but that did not stop Jason. He was determined to prove that he was fully capable of handling this situation on his own and would not let us help him. We were both amazed and impressed at Jason’s determination and ability to naigate the wheelchair in these conditions. Jason and his family were provided with a pontoon boat and a bass angler to fish the tournament. When the fish were weighed in at the end of the tournament Jason and his family ended up finishing in the top three both days. At the end of the day, prizes were given out to people that had purchased raffle tickets. When the big prize of the day was being given away in the raffle, Mrs. DeFreitas won a remote controlled fishing boat as her prize. Mrs. DeFreitas looked over at Jason’s family and decided that she wanted to give the boat to Jason’s two sons. Jason and his family won a 30" MasterCaster Rc Fishing Boat from Fish Fun Co.